We have to learn to address ourselves to multiple audiences, to speak as foreigners to other foreigners. Naoki Sakai, professor of comparative literature and Asian studies at Cornell University, does the brilliant work of bringing translation theory into dialogue with other disciplines. In his writings on Japanese studies, cultural studies, comparative literature and philosophy, the gritty questions of translation, national language, nationhood, and subjectivity emerge at the heart. 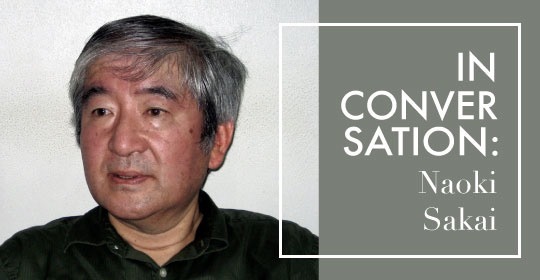 His book Translation and Subjectivity: On “Japan” and Cultural Nationalism undermines the mainstream understanding that writers and readers are defined—or confined—by national language and culture. In this interview, there is much talk of a specific “representation of translation.” Translation is most commonly represented in today’s world as a practice that happens between two wholly different national languages. Tell anyone you’re a translator and they will ask: “between what languages?” However, this is actually only one version of events. While translation can be explored in much broader terms, Sakai suggests that this particular story about translation serves to reinforce the often-menacing architecture of the nation state. In TRACES, a one-of-a-kind multilingual, cross-disciplinary journal led by Sakai, a new sort of community is created beyond the nation’s walls in which contributors speak with a “forked tongue.” As Sakai’s words suggest and as we know full well at Asymptote, this is the exciting potential of translation; it opens up new shared spaces and spaces for sharing.